Commercial flooring for schools, whether they are nursery schools, primary, junior or secondary schools, is an important decision. Whatever your education flooring needs, we have information, help and advice for you. From school entrance areas to IT suite flooring, corridors to primary school classrooms, the carpet that you choose has to have the right properties for the job. IT suites need special anti-static properties. Corridor flooring needs to be hardwearing and easy to maintain. Primary classrooms floors need to be tactile, yet durable. All flooring needs acoustic properties to help with education and learning environment. for you and your school. Commercial flooring for universities and colleges, whether it’s for lecture theatres, public places or halls of residence, is an important decision. 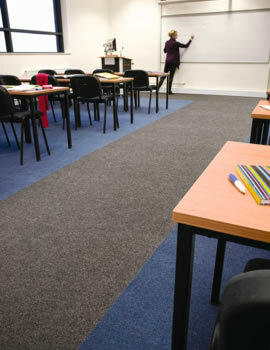 Whatever your further and higher education flooring needs, we have information, help and advice for you. From entrance areas to IT suite flooring, corridors to library flooring, the carpet that you choose has to have the right properties for the job. IT suites need special anti-static properties. Corridor flooring needs to be hardwearing and easy to maintain. Refectories and halls of residence need to be simple to clean. All flooring needs acoustic properties to help with education and learning environment. We will help you to prioritise and understand your requirements, to ensure that you make the right flooring choice for you and your college or university. 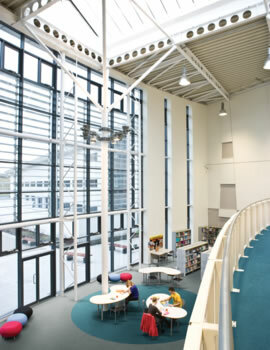 Commercial flooring for schools, flooring for colleges, flooring for universities. Whatever your education flooring needs, we have information, help and advice for you. From school entrance areas to lecture theatre flooring, university halls of residence to primary school classrooms, the flooring you choose has to have the right properties for the job. The right floor can have a huge impact, so where do you start when it comes to choosing? Corridor flooring needs to be hardwearing and easy to maintain. Libraries and halls of residence need to be simple to clean. Primary classrooms floors need to be tactile, yet durable. All flooring needs acoustic properties to help with education and learning environment. We will help you to prioritise and understand your requirements, to ensure that you make the right flooring choice for your needs.